Jim Jacobs volunteered for overseas duty in the Korean War and suddenly found himself in the thick of a war as intensive and dangerous as anything the World War II had had to offer. In this gripping memoir, Jim calmly and geographically recounts his experiences and emotions while on active service in the atrocious and terrifying war. The British Army’s considerable contribution to The Korean War 1950 – 1953 was largely composed of ‘conscripts’ or national servicemen. Plucked from civilian life on a ‘lottery’ basis and given a short basic training, some like Jim Jacobs volunteered for overseas duty and suddenly found themselves in the thick of a war as intensive and dangerous as anything the Second World War had had to offer. 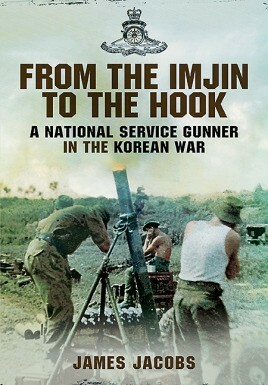 As a member of 170 Independent Mortar Battery RA from March 1951 to June 1952 Jim was in the frontline at the famous Battle of the Imjin River. By great luck, he evaded capture – and death – unlike so many. He returned to the UK only to volunteer again for a second tour with 120 Light Battery from March 1953 to March 1954. During this period, he was in the thick of the action at the Third Battle of the Hook during May 1953. In this gripping memoir, Jim calmly and geographically recounts his experiences and emotions from joining the Army through training, the journeys by troopship and, most importantly, on active service in the atrocious and terrifying war fighting that went on in a very foreign place.